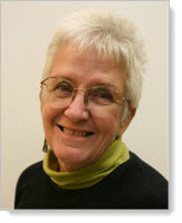 Gail lived and taught City & Guilds Creative Studies in Britain for 20 years, and was, for many years, an External Verifier for the City & Guilds Institute. 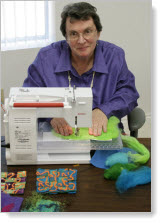 Gail has taught and continues to teach all of the Certificate Courses in Design and Embroidery at the La Conner center. 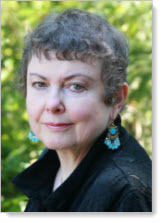 She has written five books on embroidery, with her latest, Creative Machine Embroidery, recently published in both Britain and the US. 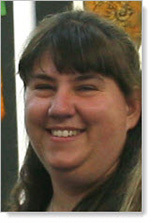 Penny holds a BA from UC Davis in Social Studies and the Arts. In 2004 she added the City & Guilds Diploma in Design and Embroidery to her other City & Guilds Certificates. Her deep professional and personal commitment to education drive her continued study in Art, Design and Stitch. She assists in a number of capacities at our center, notably teaching and demonstrating in her area of specialty, Design and Hand Stitch. 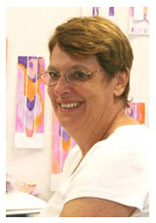 Martha Cole has been a professional fabric artist for over 30 years with explorations in artist’s books and bookbinding being a significant adjunct for the last 15. The dual focus has resulted in the fabric medium influencing the texture and forms of the book while the creation of the paper surfaces for the books has energized the surface manipulations in the fabric works. In the book medium, she creates both one-of-a-kind Artist’s Books as well as limited editions – in both cases using wheat paste applications as the primary medium. 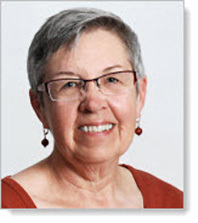 She has exhibited her books in both solo and group exhibitions across Canada, including CBBAG’s Art of the Book’03 and ‘08 and Millennium in a Box. Her work has been published in numerous articles and on-line exhibitions and she is represented in several public collections. 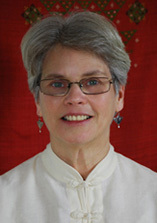 Barbara is a textile artist and embroiderer. Barbara, a retired Home Economics teacher, has a life long interest in textiles and embroidery. She is an active member of the Embroiderers’ Guild of Victoria, the Vancouver Guild of Embroiderers’ and the Embroiderers’ Association of Canada. Barbara has completed both the Level 4 Diploma in Experimental Research for Advanced Design and Level 4 Diploma in Experimental Stitch and Multi Media courses at the center. She also has a Level 3 Certificate in Design and Craft (Stitched Textiles) in the Context of Embroidery awarded by the City and Guilds of London Institute and the Level 2 Certificate in Design and Textile Decoration Techniques awarded by the Gail Harker Center for Creative Arts. After receiving a Bachelor of Fine Arts degree from Cornish College of the Arts, Dana Webb became interested in textiles and experimented extensively with fiber reactive dyes. After a chance visit to Earthues, Michele Wipplinger’s natural dye studio in Seattle, she fell in love with natural color and apprenticed with Michele for five years, learning and teaching about natural dye extracts. She has conducted classes and workshops on immersion dyeing yarns and fabrics, indigo techniques and surface design. She continues her own active studio practice and loves to share what she has learned about the colors of the earth. June was awarded the City & Guilds Diploma in Design and Embroidery in 2004 and holds an additional 3 City & Guilds certificates. 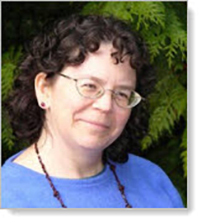 She has over 16 years experience in machine embroidery, and has taught classes for our center and the Pacific Northwest Needle Art Guild. She participates in art shows and exhibitions in the Northwest and conducts demonstrations of machine embroidery technique at various locations. Lisa holds the internationally recognized City & Guilds Diploma in Research, Design and Embroidery, as well as Level 3 certificates in Design and Embroidery and Patchwork and Quilting. During the Diploma course she discovered a love of papermaking. She continues to study papermaking and also teaches and demonstrates. Her art work, which often features stitch on handmade paper, has been exhibited at venues in Washington and Oregon. Valerie Stein earned her Bachelor of Arts degree at Oregon State University, with an emphasis in fiber design. Valerie holds the internationally recognized Level 3 City and Guilds Certificate in Embroidery and Design. She now teaches felting, surface design, and other fiber related classes to adult students in Washington.